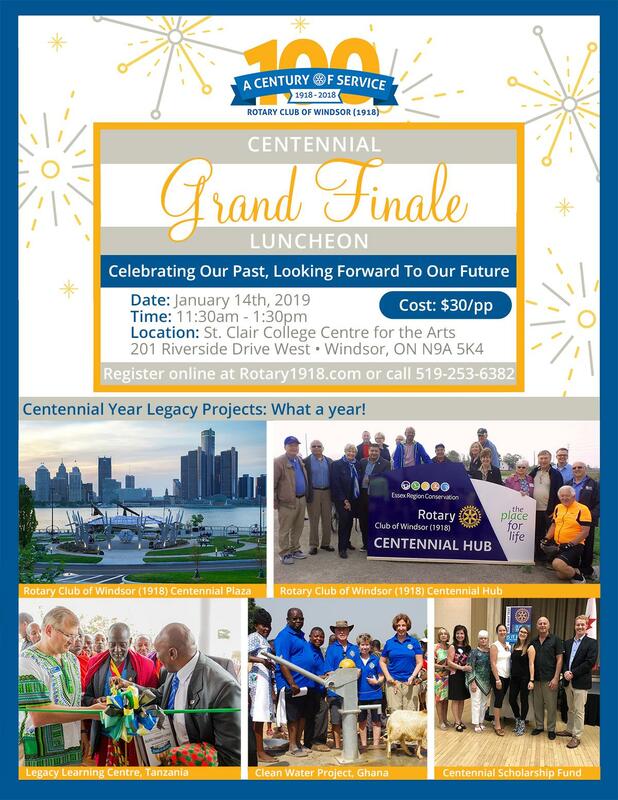 Centennial Grand Finale Luncheon: Our Club has been celebrating 100 years of Service Above Self for all of 2018, and we want to end with a party! We'll be reflecting on the past year, looking towards the future and thanking our community of members, partners and friends. Note that this event will be taking place at St. Clair College Centre for the Arts, 201 Riverside Dr W, Windsor, ON N9A 5K4. Our Club started the new year off with a fun-filled meeting this past Monday. We welcomed new member Mardrick Rogers, sponsored by Past DG Dr. Rick Caron. Present to help with the induction ceremony was Assistant District Governor Aruna Koushik. Member Colin McKillop presented the interesting environmental fact about signal trees, important heritage trees that are bended, traditionally used to help with directions (thanks Richard Wyma for these facts!). Gordon Orr, CEO of Tourism Windsor Essex, explained the vision and current campaigns the organization is involved in. He touched on the "Best of Windsor Essex Awards", gave some insight into various new tourism programs including Barrel Trail, Coffee Trail, Epic Winners and We Heart Local. The Ontario Tourism Innovation Lab is also an interesting new project that helps support new, early stage and start-up tourism experiences, product ideas and collaborative partnerships. He also mentioned the new local itinerary builder Utrip, which provides visitors the opportunity to build itineraries based on their travel patterns. 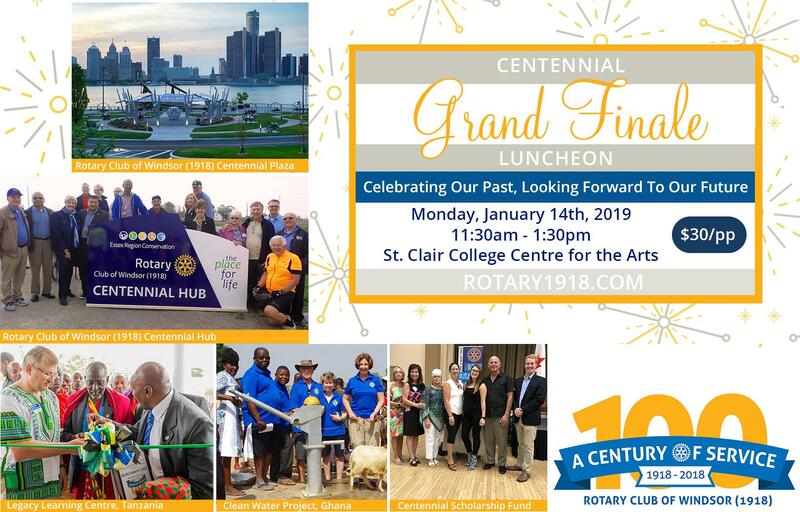 Maureen Lucas urged everyone to sign-up for the Centennial Grand Finale Luncheon which is being held this upcoming Monday, January 14th from 11:30 - 1:30 at St. Clair Centre for the Arts. 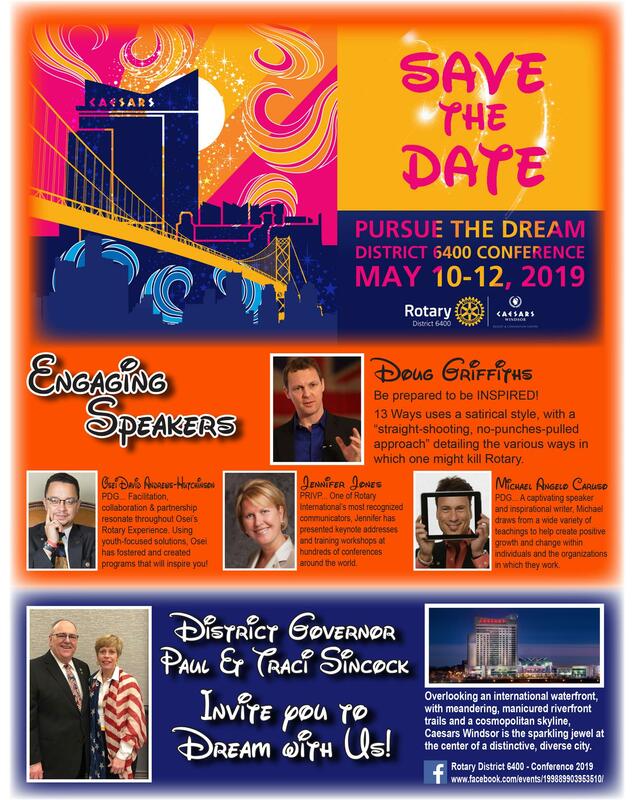 This event replaces the Monday meeting on that day. 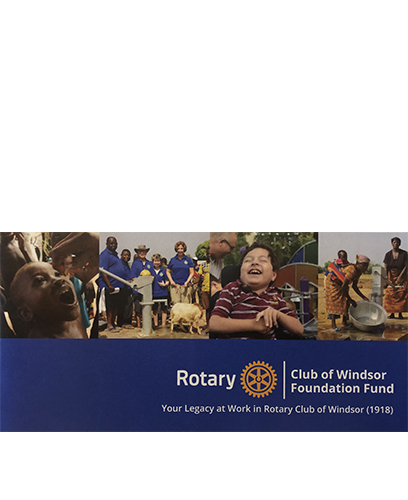 Lastly, James Rice, President Rotaract Club of Windsor 1918, urged members to enter their raffle for a chance to win a pair tickets to the Wings vs. Leafs in Detroit on February 1st. Tickets can also be purchased at their pinning ceremony, happening at 7:00pm on Saturday, January 12th at The Safety Village. 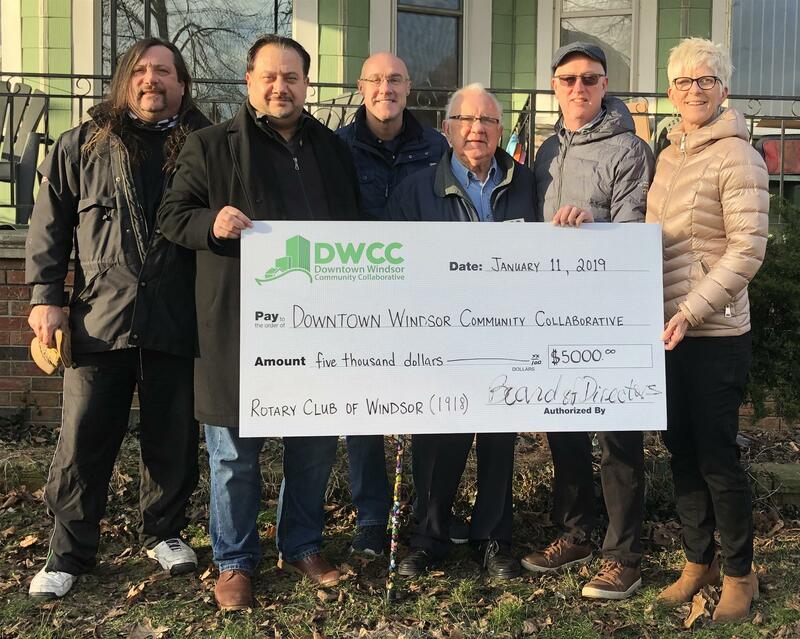 Ceasars Windsor, 377 Riverside Dr. E.
Friday, January 11th, 2019: Our Club presented a $5,000 cheque to support the Downtown Windsor Community Collaborative's Women's Community House. "Finding safe and affordable housing is especially vital for women living in precarious living conditions. To fall asleep at night knowing [they] are safe and loved is the solid foundation for rebuilding a good life." says Bob Cameron, Executive Director of the DWCC. 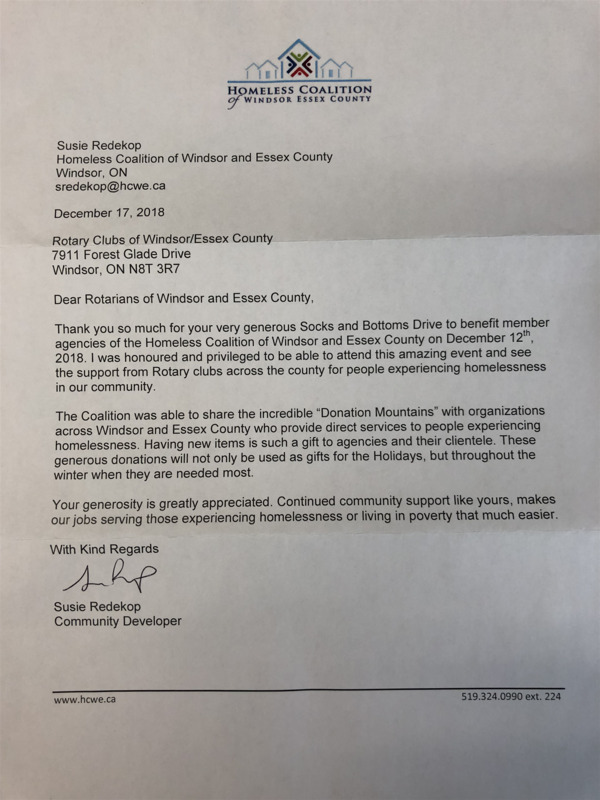 The money will be used to help renovate the basement of the Women's Community House in the hopes of creating a new basement apartment. 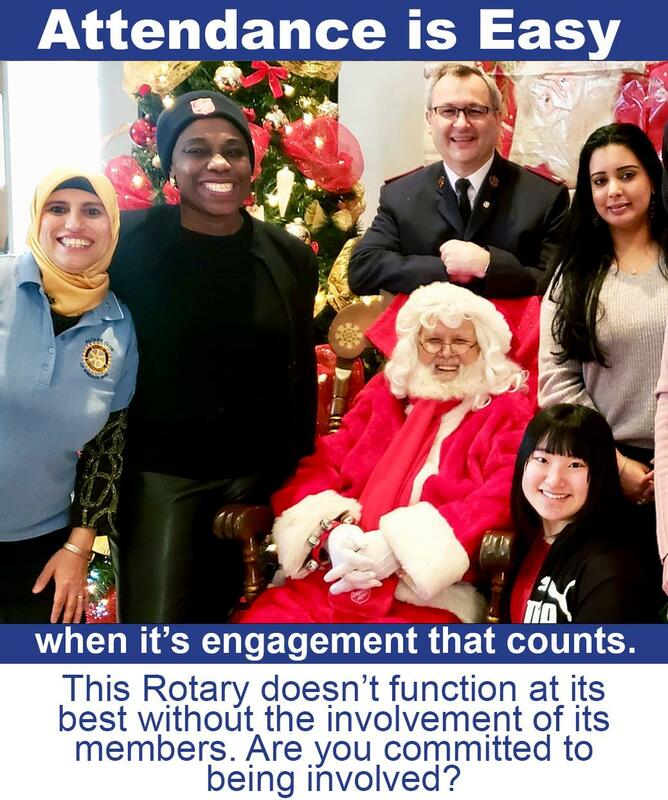 "The Rotary's financial donation helps turn an empty space into a place to call home" says Cameron. Many thanks to Mark Donlon, Leona MacIntyre, Theresa Schuurman and Michael and Walter Willms for working the Bingo on January 10th. 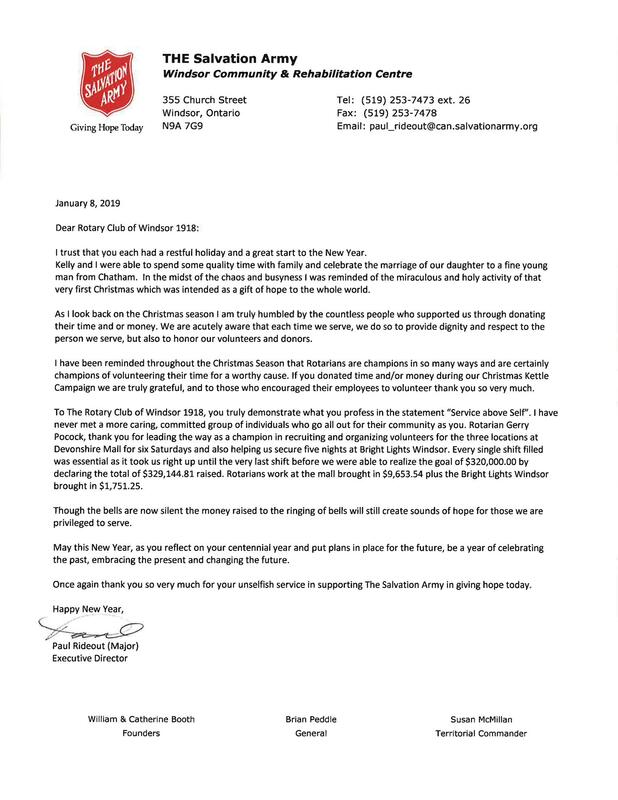 The $1,000 they raised will support the Adult Assistance Committee.